The Meta 1 is a pair of augmented reality goggles that performs some very unique and useful tricks. 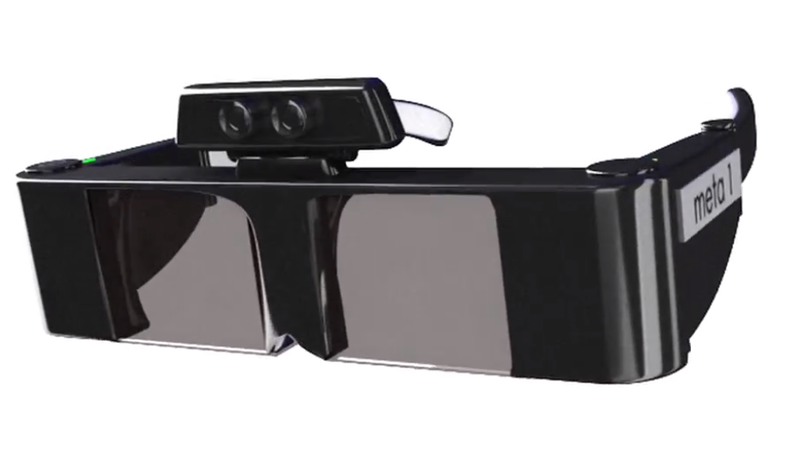 While they are still in beta stage, the glasses are coupled with a Kinect-like camera to sense objects in real space and allow users to interact with virtual worlds with the swipe of their hand. The company founder, Meron Gribetz, says that the company is on track to create a mass produced solution shortly, but until then they have brought on Steve Mann, a real cyborg and wearable computing researcher, to act as a chief scientist. You’ll recall that Mann was assaulted in a Parisian McDonald’s for wearing a Google-Glass-like headset. “We brought Mann on board because of his expertise in two key areas: miniaturization and mediated reality. Mann has been developing a Google Glass-like device for years but recognized now was not the right time for something of that scale, because of the limitations of such a device. Rather than a phone accessory, Mann is keen to work with us to develop a fully fledged new interface for computers,” said Gribetz. Gribetz is a Y Combinator alum and the project, which is still on Kickstarter, is nearly funded with 26 days to go. Users can receive a Dev Kit for $550. Epson will help build Meta’s next-generation VR glasses which will look considerably less DIY than the beta developer version. “The entrance into consumer wearables needs to be a high powered immersive device capable of fully replacing the computer and more. Heads up notification systems have their use cases, but they won’t be game changers. Mann’s commitment to a fully wearable future is why he chose to join us,” said Gribetz. Considering Mann has been wearing his computing power for most of this decade, it seems like a good fit.